A little modern irony on Tyr's Day. Tyr, or Tiw, was the Norse god of war and it is for him that we call today Tuesday - Tiws Day. So why not chuck up a photo so far removed from warfaring and agression. A floral summer's dress, smart, elegant white heels and a classic Danish bike. Chatting on the mobile, planning pleasant rendevouz' with pleasant friends, all while riding along the peaceful, segregated bike lane. On another note, when your shopping and your flowers have to get home, it requires a bit of logistics to get it all onto your bike. The Bobike seats for kids are invaluable for transport when the rugrats aren't in them. A big bag of groceries fits perfectly in the seat and can be secured with the seatbelt straps. And if you can't do all of this in heels, high or low, you're not in Copenhagen. We'll wrap up Tyr's Day with a submission from Jillian, who was kind enough to send this photo in. "Hello, I am a huge fan of your blog. It is, in fact, one of the main reasons for my decision to change my life and the life of my family. 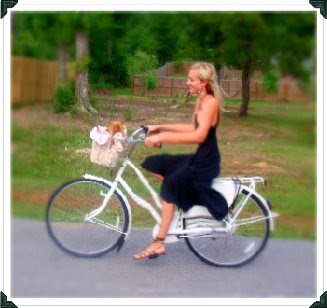 Thank you for just doing what you do[...] and keep up the beautiful work"
Jillian has a blog called Button McSweet wherein she is documenting her attempt to travel almost exclusively by bicycle and many other life changes her family is making. Thank YOU Jillian for letting us know about your quest and for sending us this lovely guest photo. I just love your blog. It's encouraged me to ride the bike more. I only wish we had bike lanes over here, rather than having to share the road with crazy, inattentive drivers. The link to button mcsweet doesn't seem to work, though. The atmosphere in Copenhagen just seems heavenly. I ride my bike often but not so much for transportation. There is an island off of our heavily congested car ridden one that encourages bycycling much like Copenhagen. It's called Block Island. Every summer my family & I take our bikes over on the ferry & stay for a few days living without an automobile. The few motorists that are there are very considerate of the bycyclists. It's always fun to visit there. argggggg today someone has stolen the saddle of my bike...i am very angry!!!!! Weeeeeeee! 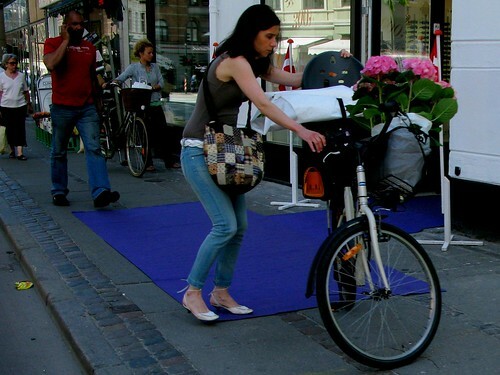 I just discovered this amazing blog and have duly RSS subscribed to this one and your other Copenhagenize one. I am a daily cycling commuter in Chicago and do not own a car. There are a few weeks of the year when there is too much ice and snow to cycle safely but it's become as normal to me as eating! I cycle in 'girl' clothes quite often too and still get asked how I can cycle in a skirt. Jeeeeeez. Get with it, old fogies! LOVE LOVE LOVE this blog. Love the way you write. It makes me snigger with delight and also say 'right on' to all your words of encouragement. this city is absolutelly amzaing! except for your comment, raquel... not so lovely to lose a saddle.